Here, with minor changes, is the review of Introduction to Physics and Astrophysics and Cosmology of Gravity-Like Fields that I wrote for the upcoming edition of the Journal of Space Exploration. The book is being offered for sale on Amazon.com today, 25 November, 2015, the 100th anniversary of Albert Einstein’s presentation of his General Theory of Relativity to the members of the Royal Prussian Academy of Science in Berlin. Featured image: The mandala of the physical forces shows six fundamental interactions. Three of them are assumed to be of gravitational nature (upper half). The standard model (SM) of particle physics has served science well for over 40 years, but scientific findings of recent decades have found it lacking in several respects. Its inability to explain gravity and spacetime require that it be extended with other ideas such as string theory, supersymmetry or quantum gravity to fit both theory and evidence. However, recently conducted experiments at the Large Hadron Collider (LHC) and the ACME collaboration have called into question those additional extensions in their current form. Where does physics go from here? The book “Introduction to Physics Astrophysics and Cosmology of Gravity-Like Fields” provides an alternative mechanism to explain the phenomena of dark matter and dark energy. Based upon Extended Heim Theory (EHT), the mechanism proposed introduces novel fundamental particles that explain anomalous experimental results while eschewing the aforementioned extensions to SM. By doing so it also provides a challenge to current orthodoxy that there are four (and only four) fundamental forces in Nature. The authors, Walter Dröscher, who collaborated with Burkard Heim, and Jochem Hauser, Professor Emeritus with extensive experience on propulsion and aerodynamic analysis for ESA, describe the existence of two previously unrecognized fundamental gravitational forces in Nature. Experiments cited throughout suggest that gravity-like fields of significant magnitude and predictability may be capable of being generated. The control of such fields may lead to gravitational engineering and a novel era of spaceflight. As the authors admit, this is a highly speculative topic and eventually may turn out to be wrong. What they endeavor to achieve in this primer is to bring into one publication all of the theory and supporting evidence to describe this extension of general relativity. EHT is a novel departure from the standard model — one that predicts the existence of additional gravity-like fields derived from the conversion of electromagnetic fields into gravitational fields through symmetry breaking at cryogenic temperatures. Extraordinary claims require extraordinary proof, and extraordinary ideas such as those presented in this book are backed by a wealth of evidence from eleven recent experiments. Dröscher and Hauser offer results gathered in laboratory experiments, field experiments and observations that point our understanding the universe in a new direction. The results of experiments performed separately by M. Tajmar and R. Graham are examples of one branch of evidence. Another is the unexpected results given by Gravity Probe B. Yet another is represented by studies of the movement of satellite galaxies by advocates of Modified Newtonian Dynamics (MOND). If correct, EHT forecasts previously undiscovered capabilities in Nature as well as limits to popular yet fanciful notions of how humankind might travel to other regions of the Cosmos through wormholes. This primer is accessible to non-physicists who are open to learning new concepts and are willing to undergo the challenge to grasp new materials, even if they may not fully comprehend the higher mathematics involved. Several sections of the book are rigorous in describing the mathematics of an eight-dimensional internal space, but readers do not need a complete understanding to appreciate the of scope of this comprehensive introduction to a new model of physics and its potential outcomes that may not be fully exploited for generations. EHT predicts the existence of six gravitational bosons and reframes gravitation as the sum of Newtonian gravitation plus two additional gravitational forces. Current physics has no explanation for the existence of exactly four fundamental forces. As the authors ask, “…the question therefore arises, are there any additional fundamental physical interactions? Perhaps it is classical physics and not quantum mechanics, that is incomplete and that there might exist additional long range interactions,” and they cite the addition of two extremely weak gravitational forces. The gravitational bosons are suggested to result from the conversion of electromagnetic fields into extreme gravitomagnetic or gravity-like (acceleration) fields. This conversion is triggered by a phase transition at cryogenic temperatures and caused by gravitational symmetry breaking in a process analogous to superconductivity. This connections between gravity and superconductivity is also outlined in the upcoming e-book, Gravity and Superconductors, which presents theoretical and experimental research for novel gravity-like fields. However, as the authors point out, there is as yet no firm experimental basis for these ideas, which therefore needs to be classified as highly speculative. Even if they do not present the full picture, they might shed new light on the nature of gravity as well as the number and type of fundamental forces that exist in Nature. Extended Heim Theory was so named to acknowledge physicist Burkhard Heim as the first to present a novel physical idea for the construction of a poly-metric tensor encompassing all physical interactions, but the comparison ends there. Despite its name, EHT is not a mere extension of Heim’s initial six-dimensional approach developed in the 1970s. EHT derives the mathematics anew and adds an information subspace not included by Heim. Though the primary author, Dröscher, cooperated with Heim for many years and co-authored Vol. III of Heim’s work, EHT gives a more consistent classification scheme for all physical interactions and particles (fields). Throughout the book the authors employ a novel technique of color coding key passages based upon whether their contents describe physics that are incomplete, physics requiring novel theory, or physics consistent with accepted theory. Other categories are given as well and help inform the reader of which aspects of the theory are novel departures from currently accepted physics and therefore require rigorous proof. The book begins with an introduction to the emerging physics for gravity-like fields and is followed by a chapter on recent experiments challenging current physics. The authors delve into the consequences for string theory, supersymmetry, wormholes, and hidden dark matter in light of experimental results found at the LHC. The LHC has so far not found particles predicted by supersymmetry, thus challenging current theory required to extend the standard model of physics. Hauser has been a member of the Technical Committee of Future Flight at the American Institute of Aeronautics and Astronautics (AIAA) and so it is not unexpected that chapter 3 explores a Short History of Space Propulsion, which outlines the need for advanced space propulsion, the current status of propulsion and how new opportunities would be opened with the advent of propellantless propulsion. It is notable that M. Tajmar (previously mentioned and Professor and Chair for Space Systems at the Dresden University of Technology’s Institute of Aerospace Engineering) recently published positive test results for the EmDrive, another proposed propellantless propulsion device. In the chapter Physical Concepts for Novel Interactions, the authors state that in order to achieve the geometrization of physics (explored by Einstein, Schrödinger and Wheeler) a poly-metric tensor must be constructed to account for all physical interactions. Unsuccessful attempts were made by Einstein to extend his mono-metric to a poly-metric tensor. However, in order to accomplish this task, the belief in the existence of four fundamental forces is not sufficient. Instead, a classification scheme of all possible physical interactions and their associated particles of both ordinary and non-ordinary matter is needed. Without a poly-metric tensor even sophisticated mathematics are insufficient to explain dark matter and dark energy. It is notable that in previous publications the authors had not expanded so completey on the concepts behind EHT. They explore the core ideas behind the Weltbild (world view) that is the foundation of EHT. This includes an in-depth discussion of the Principle of duality (formation/annihilation) governing all physical events in the Cosmos, and the joint and simultaneous generation of spacetime and dark energy. Other founding principles for consideration included in the discussion are the Principle of finite existence of time, the Principle of perfect organization and optimization, and the Principle of correspondence between number system and matter. These founding principles also act to exclude certain physical phenomena, ruling out both singularities and infinities in physics. Everything in the Universe is in motion. Nothing is static. EHT excludes multiverses, singularities in the form of wormholes and the possibility of traversing singularities between points in space. These tenets also exclude superstring theory as currently proposed and thus no supersymmetry. This leaves the standard model severely lacking. Lack of superpartners means that dark matter cannot be made of neutralino particles or WIMPS, though other types of matter beyond the standard model might exist. Finally, spacetime is considered discrete at the Planck level and built from quantized elemental surface elements termed “metrons” by Burkhard Heim. Having established these precepts, the authors go on to describe how EHT extends the physics of quantum mechanics and general relativity through two pillars: Heim space and an imaginary time coordinate leading to a dual spacetime entangled with normal spacetime. Heim space, or internal gauge space, postulates an interaction between electromagnetism and gravitation at cryogenic temperatures with the potential to form the basis of gravitational technology. The eight forms (H8) are organized into four sets of subspaces (making eight dimensions), consisting of the height-width-depth of physical human experience (R3), the one of time (T1) which is considered imaginary), two for organizing “internal spatial” coordinates (S2) and EHT’s new addition of two time-like dimensions representing “information” coordinates (I2). The second pillar is addition of an imaginary time coordinate that extends the concept of spacetime by adding a dual spacetime for imaginary particles. Along with internal gauge space, the dual spacetime predicts the existence of non-ordinary matter with negative mass (dark matter) and other virtual particles not subject to direct measurement. As the authors put it, “The Cosmos is governed by the principle of symmetry…“ and symmetry creates physics. The chapter that follows presents to the reader the basic formulation of EHT as a fundamental theory of physics. The eight dimensions (H8) of internal gauge space give rise to a set of 15 hermetry forms. The word hermetry is a combination of hermeneutics (meaning interpretation) and geometry. A hermetry form stands for the physical meaning of geometry. Those 15 forms contain both ordinary matter (OM) and the already mentioned non-ordinary matter (NOM). Ordinary matter is represented by leptons, quarks and bosons (carrying the four known fundamental forces). Non-ordinary matter is represented by stable neutral leptons and particles of imaginary mass including those particles carrying gravity-like forces, the gravitophoton (attractive and repulsive, interacting with matter) and quintessence (weakly repulsive, interacting with spacetime), carriers of the two new gravity-like fields. Together, the value for the gravitational constant, or “big G” is no longer a constant due to a single force mediated by a single particle, the graviton. It is a composite of fields mediated by three particle types: the graviton (GN), the gravitophoton (Ggp) and, specific to EHT, the quintessence particle(Gq). Therefore G = GN + Ggp + Gq. Subsequent chapters cover propagation speeds. The three gravitational fields produce three gravitational constants giving rise to three different propagation speeds of light in a vacuum. One is c, the currently recognized speed of light, while cgp is 1.6 X 105 c, and cq is 2.5 X 1010 c. Also covered are requirements for symmetry breaking, conversion of non-gravitational fields into gravity-like fields and an chapter dedicated to the analyses of experiments by Tajmar, Graham, GP-B. 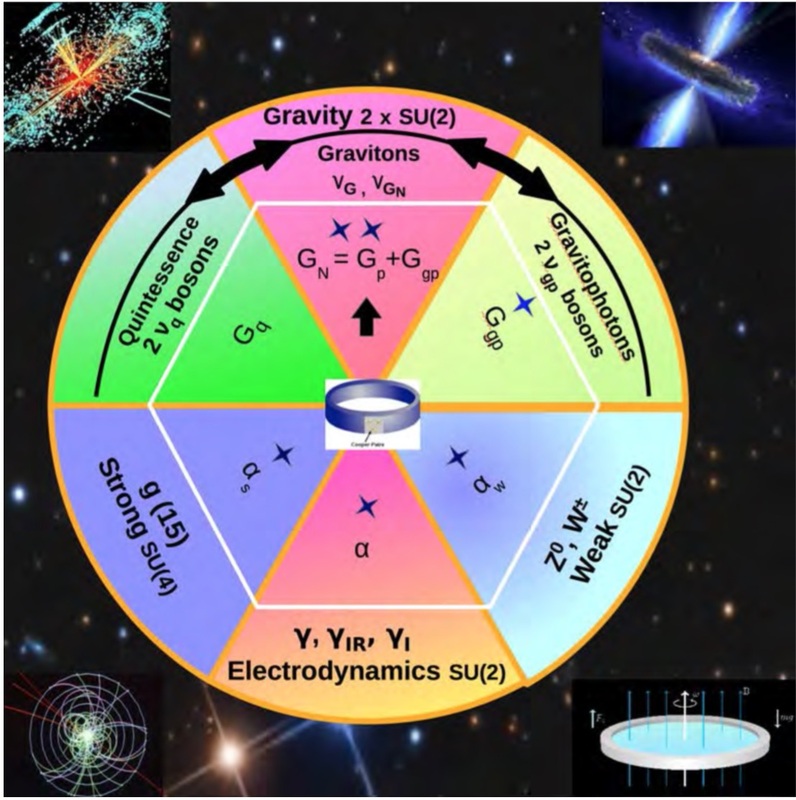 Experiments performed independently by Tajmar and Graham that indicated generation of extreme gravitomagentic or gravity-like (acceleration) fields in the laboratory are reviewed in great detail. Though Tajmar reported diminished results with later experimental configurations, his original results and the reduced signal strength in later experimental configurations can be explained by EHT. In an analysis of the results of Gravity Probe B (GP-B), extreme gravitomagnetic fields, similar to the ones reported by Tajmar et al., might have been present in orbit and may be (at least partially) responsible for the large reported gyroscope misalignment. Having established their proposals for theory, in the chapter Extreme Flying Machines from Gravitational Engineering the authors describe configurations and bench tests for creating devices to generate field propulsion — both at cryogenic temperatures and at room temperatures. It is easy to imagine that this might lead to a number of experimentalists taking up the challenge to attempt replications of these configurations, whether in isolated labs or as open-science efforts. Configurations may be for field propulsion or to generate self-sustaining rotation (a gravitational analog of the homopolar electric motor) to be used in power generation. The book concludes with the chapter The Road to a Different Age, which is more of a philosophical treatise on the new mindset that will accompany our changing views about physics. Should EHT be found true, even in part, extensive changes in physics are likely to impact our long held beliefs in how the Cosmos works. The authors suggest that a revolution both in propulsion and in energy generation should be expected, resulting in sea changes in transportation. It is time for a paradigm change. The authors conclude with arguments for average citizens to be educated so that they can critically evaluate science. Without a rigorous effort directed at gaining an understanding of science, citizens are likely to not differentiate between well conducted scientific studies and “junk” science. Examples are given regarding the science behind anthropogenic global warming versus that pointing to naturally occurring global warming. Though the authors cite exemplars supporting the latter (and this author the former), the point is well made that a critically thinking populace will be needed if evidence-based policy decisions are to be based upon solid scientific thinking.